Moina (Moina macrocopa) is a common freshwater crustacean generically known to tropical fish keeping enthusiasts as the water flea. They are found to some degree in all parts of America, Africa, Asia, Europe, and almost every continent on earth. Moina macrocopa are commonly found in stagnant or very slow moving water that contains large amounts of decomposing organic material. High concentrations of Moina macrocopa are usually found in stagnant pools, slow moving streams, ponds, lakes, ditches, sewage polluted waters, and swamps holding large amounts of decomposing material. In South East Asia, Moina macrocopa is grown on a massive scale to specifically handle the high pollution levels found there. The highest concentrations of Moina seem to appear in temporary bodies of water where optimum conditions exist for only short periods of time. They are extremely tolerant of poor water quality and fluctuations of dissolved oxygen levels that can vary from almost zero ppm, to super saturated oxygen levels. The reason Moina macrocopa survive in oxygen poor environments is because of their ability to synthesize hemoglobin. Hemoglobin production is also believed to directly affect higher population densities and their ability to withstand high temperatures. Moina are extremely resistant to water temperature extremes and easily withstand daily variations between 41°F and 88°F (5°C–31°C). Their high tolerance to temperatures make them a favorite for commercial fish farmers and tropical fish keeping enthusiasts who raise their own live foods at home. Like all Daphnia, Moina macrocopa have a pinkish colored body consisting of a head and a trunk. They have large compound eyes on the side of the head that lie just under the skin, and a pair of antennae that appear to be their main method of locomotion. The trunk is encased in a carapace that is periodically molted and the open brood pouch, where their eggs develop in female Moina, is located dorsally on top of the trunk. 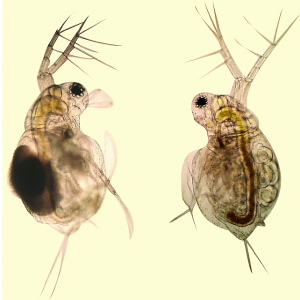 The brood pouch of Moina is open, whereas Daphnia posses a completely closed pouch. Moina macrocopa are smaller than their well known cousins Daphnia pulex, and their slightly larger relative Daphnia Magna. Because Moina macrocopa are smaller than Daphnia pulex, (0.02-0.04 inch) and have a have a higher protein and lower fat content than other Daphnia; tropical fish keeping enthusiasts consider them an ideal live food for the smaller, hard to feed fish species. Young Moina (less than .02 inch) are approximately the same size or only slightly larger than adult rotifers , and smaller than newly hatched brine shrimp. The diminutive size of young Moina macrocopa makes them ideally suited for feeding to all types of very small fish fry, and a variety of tiny fish species. Moina reproduce both sexually and asexually. Under optimal conditions, Moina populations are all female that reproduce asexually when they are 4 to 7 days old. Each female will produce from 4 to 22 broods every 1 to 2 days, with a lifetime production of 2 to 6 broods per female. Under less than optimal conditions (abruptly diminished food supply), more males are produced and sexual reproduction resulting in ephippia (eggs similar to brine shrimp) occurs. The switch from asexual to sexual reproduction is apparently stimulated by the amount of food that is available. A sudden reduction in the food supply will result in an increase in egg production. This also produces fewer young. An increase in the food supply results in increased asexual reproduction with a much higher population of females and fewer being produced with resting eggs. When Daphnia have very high populations, a dramatic decrease in reproduction results, however, this is not the case with Moina macrocopa. Moina are easily cultured using any of the methods currently used for culturing Daphnia and other crustaceans in the Moinidae family. Many Tropical fish keeping enthusiasts culture Moina at home in containers as small as a 10 gallon tank, or even a 5 gallon bucket. For larger scale production or commercial operations; small ponds, animal watering troughs, plastic wading pools, old bathtubs, tanks, vats, or any large concrete, plastic, fiberglass or stainless steel container can be used. Because Moina are extremely sensitive to copper, zinc, and chemical pollutants that are often present in tap water, use only bottled spring water or water collected from natural sources for culturing them. The optimum water temperature for raising Moina is between 75°F and 88°F, at a pH between 7.0 to 8.0. Low water temperatures and pH levels in excess of 9.5 will decrease the amount of Moina being produced. When culturing Moina indoors, avoid sudden changes in water temperature and provide them with enough light and gentle aeration in the form of large air bubbles to break up any surface film. Aeration also keeps food particles in suspension and increases phytoplankton production which results in an increase in the number of eggs per female, the proportion of egg bearing females in the population, and the total population density. In outdoor containers aeration is not necessary. Moina feed on bacteria, phytoplankton, yeast, decaying organic matter, and are one of the few organisms that utilize the blue green algae, Microcystis aeruginosa. Because Moina primarily feed on phytoplankton suspended in the water column (basically green water and protozoa), and large populations can quickly clear a pond of green water; feeding them green water over an extended periods is not practical. Fresh or dehydrated manure and sewage sludge is widely used to culture Moina in commercial applications. To feed the Moina, fresh or dried manure, sewage sludge, bran, hay, and oil seed meals is suspended in burlap type mesh bags in the water column. The following quantities of listed materials are used per 100 gallons of water initially as food for Moina. One half to an equal amount should be added in 5 days. 0.3–0.5 ounces (8.5–14.2 g) of baker’s yeast. 0.3–0.5 ounces (8.5–14.2 g) of yeast, and 0.5 ounces (14.2 g) of ammonium nitrate. 1.5 ounces (42.5 g) of alfalfa pellets or meal, 1.5 ounces (42.5 g) of wheat or rice bran, and 0.3 ounces (8.5 g) of yeast. 5 ounces (142 g) of dried manure or sewage sludge, 1.5 ounces (42.5 g) of wheat or rice bran, and 0.3 ounces (8.5 g) of yeast. Use 5 ounces (142 g) of dried manure or sewage sludge, 1.5 ounces (42.5 g) of cotton seed meal, and 0.3 ounces (8.5 g) of yeast. Combine 20 ounces (567 g) of dried manure or sewage sludge. Combine 6 ounces (170 g) of dried manure. 0.2 ounces (6 g) baker’s yeast, 0.1 ounces (3 g) spirulina powder. Add the above amount for the first two days, and every other day until culture is harvested. For culturing Moina at home; alfalfa, bran, and yeast are less objectionable to use and works almost as well. Combine equal parts of a 1 1/2 gram mixture of yeast , soy flour , and spirulina into a glass of warm tank water (to activate the yeast) until fully dissolved. Stirred into 2 liters of pond or aquarium water and pour the suspended mixture evenly around the culture. The mixture produces enough food for an established 80 gallon outdoor Moina culture. Feed daily during the warmer summer months, and every 3 or 4 days during the cooler months. Do not overfeed your daphnia cultures regardless of species. Under optimal conditions, Moina populations are all female that reproduce asexually when they are 4 to 7 days old. Individual females will produce 4 to 22 broods every 1 to 2 days, with a lifetime production of 2 to 6 broods per female. The switch from asexual to sexual reproduction is apparently stimulated by the amount of food available. An abrupt reduction in the food supply will result in an increase in egg production. This also produces fewer young that are mostly male. 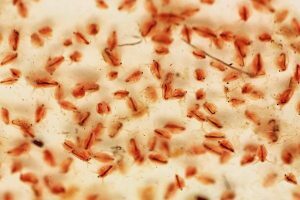 An increase in the food supply results in increased asexual reproduction with a higher population of females, and fewer produced with resting eggs. A well fed Moina culture will typically reach densities of 19,000 individuals per gallon.